The New Culture Movement in China was considered by contemporaries to be the “ushering in of a brand new age,” one that was destined to be as brilliant as the European Renaissance. Its protagonists, not unlike those of the European Renaissance, staged themselves and their movement as one of unprecedented importance. Renaissance men thought of themselves as living in a new kind of age, an aetas nova. Not unlike the protagonists in the New Culture Movement, they used the verb renascere (among other metaphors) to refer to their achievements because they were convinced that they were reviving the creative spirit of the ancients. The very use of the term “Renaissance” – a new or a re-birth – thus became a “significant element of the epoch,” and this characteristic was important to those inspired by the Renaissance in China. The idea of Renaissance (first known as rinascita) in Europe was invariably connected with (and caused, or enabled by) the notion of an age of darkness and obscurity that preceded it – the Middle Ages – and thus, engendered a need to “break free” from this age and all its implications. In emphasizing the darkness of this previous age, just as in chiaroscuro, the brightness of the new age shines ever more brightly. And indeed, it was by stressing this strong opposition between dark and bright, between dead and (newly) alive etc. that Europe’s and China’s Renaissances actually became the epochal breaks described both by contemporaries and by later scholars. To China, this reading of heroic renaissance men and the Renaissance itself as a fundamental and epochal break with the traditions and orders of the past, was important. They saw that those living in the Renaissance had been convinced that rebirth would only be possible through a release from the bonds of medieval traditions and that they must instigate a fundamental break with this past in order to retrieve and reconsider, under a new light and from a new perspective, the glories of Antiquity. This Chinese interpretation highlighted, in particular, the Renaissance’s conscious and epochal rupture with its immediate past and the fact that this allowed for a new beginning, which in turn made possible a new view of all that was (and had ever been) Chinese history. China’s leading figures in the early twentieth century invoked the Renaissance as a key term and the fundamental logic for the construction of their own modern national culture. 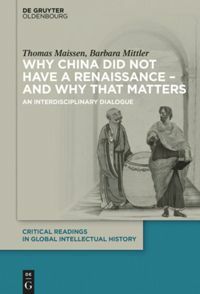 The role that Renaissance played in narratives of modern Chinese developments is, in and of itself, significant: Chinese intellectuals evidently felt compelled to transplant European ideas and periodization schemes into Chinese contexts for their own reasons. They adopted a specific moment from Europe’s past, the Renaissance, to interpret their own history, to present their special predicament, their distinctive future perspectives as well as their particular perceptions and characteristic attitudes towards historical time. So, did China have a “Renaissance” after all? And does that matter? Reading the Chinese Renaissance – as depicted by its own protagonists – may take us quite far from European conceptions of the period, however. And here we may start to ask just how literally we should take the big and sought-after labels of periods like the Renaissance. So, did China have a “Renaissance” after all? And does that matter? While some would reserve such vocabulary for the European experience, one might also argue that, while not universal, a term such as “Renaissance” has in fact been fruitfully applied to describe other cultural and historical experiences – the Chinese modern being only one among the lot. Even within Europe, there were indeed many (national/regional) renaissances, not just one. It might be useful, therefore, to begin enriching our vocabularies such that we are able to include these alternative readings of “r/Renaissance” in established systems of historical periodization. This is not to say, that the term “r/Renaissance” should be used arbitrarily, nor is it to say that it did not once have European roots, which it certainly did. But I would contend that we should focus on the dynamics of its global interactions, to observe the processes of translation, adaptation, reinvention (or even the “renaissance”) of these terms, and to work towards a History-In-Common. Early modern history entails not just a history of the sixteenth to eighteenth centuries, it also denominates as “early modern” something that logically precedes, prepares and – not least – helps us to understand the “modern” period, which started around 1800 and is characterized, for example, by the industrialization and urbanization of mass societies in nation-states. These are, however, phenomena that remained for a considerable time limited to very particular places, even in Europe and North America, and a fortiori elsewhere on the globe. As there is no Reformation and no Confessionalization beyond Europe, can there be a Renaissance elsewhere? Or an Enlightenment? Both are core concepts in a positive interpretation of the (European) path towards modernity, which is based on individualism, emancipation, rationality, secularization, democratic participation, and so on. There is an obvious danger that a superiorist Eurocentric interpretation continues to do what it has done for centuries – namely, claiming these and other positive aspects of civilizational development and change as properly and only European qualities; or worse, as the exclusive qualities of specific occidental nations. However, the question remains: Is the antidote to such claims for cultural and political superiority and hegemony to be found in proclaiming a historiographic “not you, we too”: Your European Renaissance (or Enlightenment) is not as bright as you think, and it is not unique, because we had one, too? The battle against a Eurocentric master narrative is not won if one transfers concepts or epochs that originate in Europe to other areas where they do not correspond to historical and cultural long-term developments. No one ever proposed using an epochal name such as the Zhou Dynasty to describe historical change in Europe. This assumption arises regularly among those who understand Renaissance (only) as an increased interest in the art and literature of a distant, “classical”, and exemplary past. Such moments of interest are indeed a widespread cultural, even a common human experience. It may not be a coincidence that an anthropologist like Jack Goody insists that the many renaissances worldwide be understood as “looking back” and a “revival”. The advantage of using a word such as “renaissance”, with a lowercase r, in a wide and open sense is arguably that it allows for easy comparison with similar phenomena. Then the Renaissance with a capital R would eventually become just the “Italian renaissance”, and thus only one among many “renaissances”. However, to insist on the particularity of, first, the Italian, then, the Western European Renaissance with a capital R is not a claim of occidentalist property or copyright over a term or concept with positive connotations. The insistence stems from the historian’s wish to understand the particularities of a phenomenon he studies – in this case, the Renaissance – and of his convintion that these particularities contribute to a better understanding of aspects that, in a very tortuous way, have indeed contributed to the “rise of the West,” to “modernity” or just to the temporary relative advantages that give answers to a still fascinating and tricky question: why, around 1800, did (only) some European countries engage in a rapid process that changed largely agrarian and locally bound societies into industrialized and urbanized mass societies? Can we come to a global concept or conception of Renaissance or other epochs by “enriching” our vocabularies with alternative readings? This “enriching” sounds like defining an epoch or its denomination in a very wide sense in order to make it as inclusive as possible – that is, to include a large number of historical experiences that somebody has once called “renaissance”. Yet in order to accentuate comparative distinctness, ideal types reduce the quantity of a concept’s possible contextual aspects – quite the opposite of “enriching” it, which to me corresponds to a broadening of its meanings, thus making them fuzzier rather than more distinct. My impression is that “enriching” a term such as “Renaissance” would be to pretend that “Renaissance” is not a particular term that can be localized historically and culturally, but that it is a universal process to be found over all times and in many civilizations, with distinctions of course, but with distinctions that matter less than the commonalities. My assertion is quite the opposite: What distinguished the Italian renaissance of the fourteenth to sixteenth century, therefore, merits an exclusive claim to the title “Renaissance”.